Liz Barry has been offered the opportunity of a lifetime – two months in Mumbai working with a Bollywood dance studio. 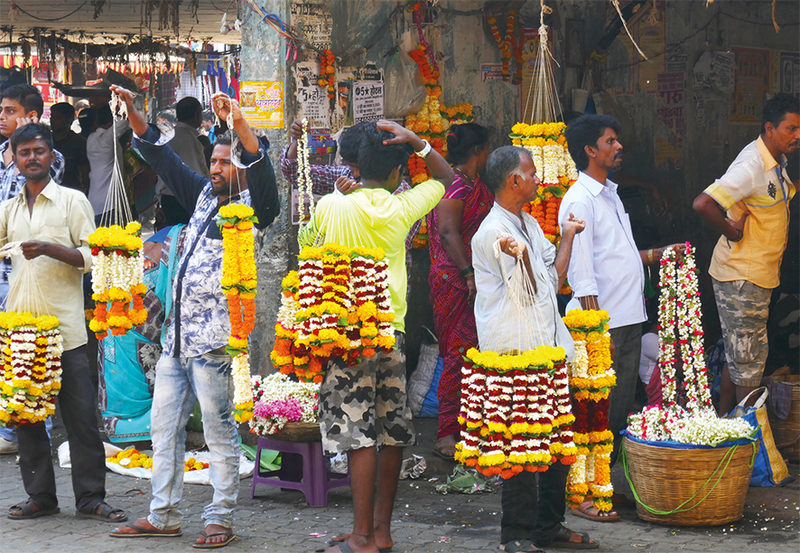 This month Liz sent Bay photographs that she had taken while in a flower market – to say she is in her element is an understatement and we look forward to seeing more of her Indian adventure in the months to come. 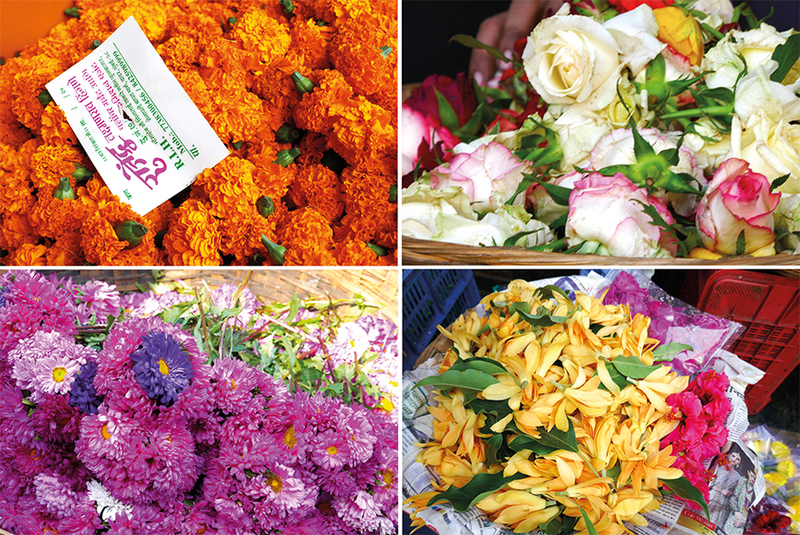 The vibrant colours of mountains of flowers are a sight to behold as you walk through Dadar Phool market, one of Mumbai’s oldest wholesale flower markets. 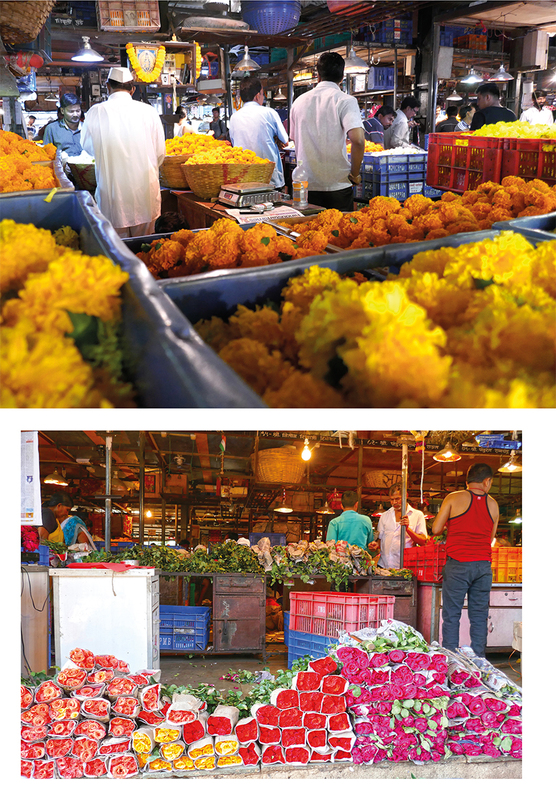 There is a frenzy of activity as porters run through narrow aisles and a maze of passageways amid over 700 stalls, burdened by flower sacks resting on their shoulders. Money changes hands and ledgers are writ-ten into, beneath the burning lamps. The air vibrates with shouting voices negotiating deals from 4 am, when buyers come to select the best flowers to decorate Mumbai’s most prestigious hotels, alongside event managers and wedding florists. Throughout the morning the chaotic activity continues, as trucks arrive from across the state and stock is loaded on barrows, bikes and anything else with wheels to be transported to shops and roadside sellers. 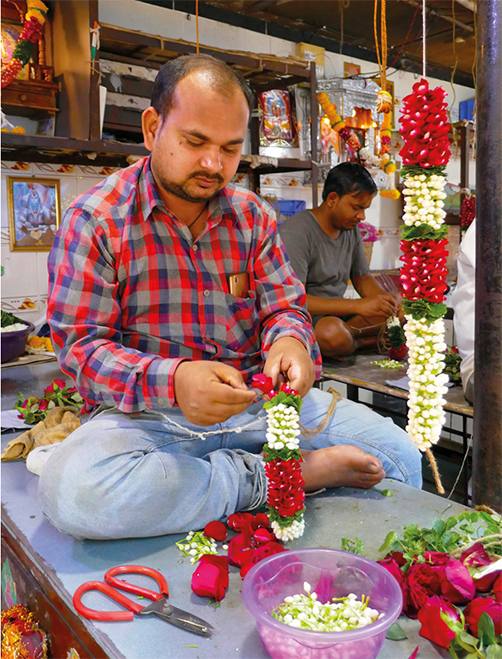 There is an endless demand for floral garlands to adorn the many temples throughout the city; flowers are an important part of Indian culture. An area of the market is under cover where the sweet scent of flowers, heady in the air mixes with the not so sweet scent of the fish market alongside. The road is edged with groups of men and women sitting on the tarmac, eking out a living selling to whoever may pass by, just feet away from their make-shift dwellings; a pavement sanctuary and family home. Further along the road the outside market flourishes beneath the train tracks where men sit threading pom-poms of orange marigolds onto seemingly never-ending chains. Basket upon basket of flowers are on display, from yellow and burnt orange chrysanthemum, delicate creamy white rajnigandha flowers, exotic varieties of lotus and orchids to bunches of peach, pink and red roses tightly wrapped in the pages of yesterday’s news. Making your way through the throngs of people and flower baskets is a sensory journey well worth set-ting your alarm for – mingling with the vendors that arrive before sunrise from outside the city with their stock of fresh flowers. 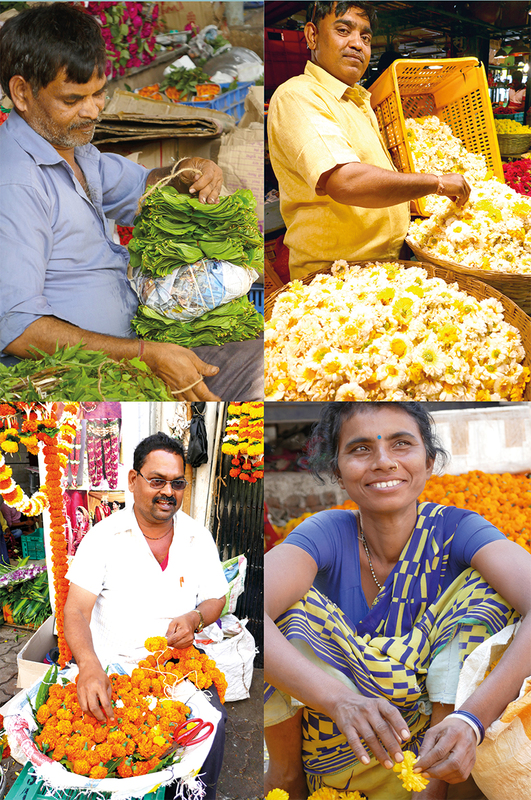 As dawn breaks the flow of customers arrive, many are regulars buying fresh marigolds; a daily ritual for morning prayer, others to buy flowers for a special occasion or celebration and many more curious visitors and photographers that have heard about Phool Gully which translated from Hindi simply means Flower Street, a magical place.